Gerald Flood was born in Portsmouth, the son of a Naval family. He was a wireless operator during the Second World War and worked as a filing clerk after the War ended until he landed a job with the Farnham Repertory Company. He toured in rep, and appeared in productions including Hamlet, Power and Glory and Charley's Aunt. In 1960 he performed in The Complaisant Lover at the Globe Theatre and went on to appear in The Formation Dancers, Children’s Day and There's A Girl In My Soup. In the 1960’s he appeared in a science fiction series Pathfinders in Space (1960), and its sequels Pathfinders to Mars (1960-1961) and Pathfinders to Venus (1961). Other television roles followed, including The Ratcatchers (1966/67), Third Time Lucky (1982) and (after Doctor Who) Bleak House (1985). He also guest starred in episodes for shows like Randall and Hopkirk (Deceased) (1969), Steptoe and Son (1970), Tom Brown's Schooldays (1971), Paul Temple (1971) and Return of the Saint (1979). His film roles included Black Beauty (1946), Patton (1970), Smokescreen and Frightmare (1974). He died in April 1989. Kamelion is, in many ways, The Doctor’s most tragic companion, possessing so much potential - both in reality and in The Doctor’s fictional universe -, and yet lacking the ability to explore so much of it due to circumstances beyond his control. A completely artificial companion in both contexts - he was actually a remote-controlled robot specifically designed for Doctor Who rather than a man in a costume -, Kamelion’s opportunities to participate in the TARDIS’s travels were limited from the beginning due to the death of the only member of the production crew who truly understood how to operate him before his first episode was filmed, restricting his role in the series from the start. 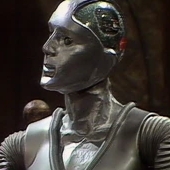 In the context of the show itself, Kamelion was a shape-shifting artificial life-form designed by an ancient race, possessing a pseudo-metabolic extension into the fifth dimension that would allow him to store or draw on additional mass to suit varied body forms, who was discovered by The Master when he was temporarily trapped on the planet Xeraphim in the distant past. With Kamelion’s programming causing him to be automatically loyal to the strongest mind in his immediate vicinity, Kamelion was swiftly taken over by The Master, who used him as his puppet in various schemes across the universe, Kamelion’s ability to completely transform his physical appearance - even his ‘default’ form was merely a disguise, although we never learned precisely what he would look like without any disguises - making him an invaluable tool. However, although Kamelion lacked the ability to defy The Master, he still possessed some degree of free will, causing him to become increasingly uncomfortable with the roles The Master forced him to play, leaving him longing for an alternate to The Master even as his nature compelled him to obey the Time Lord. Kamelion eventually appeared to gain his freedom when The Master had him pose as King John in an attempt to alter the outcome of the signing of the Magna Carta. Although the ‘king’ initially attempted to use the arrival of the TARDIS to further The Master’s ambition to discredit the king, with the king introducing the Fifth Doctor, Tegan Jovanka and Turlough as his ‘demons’, The Doctor eventually saw through The Master’s deception, subsequently discovering Kamelion’s true identity. In a battle of wills between the two Time Lords, The Doctor appeared to win control of Kamelion away from The Master, Kamelion subsequently expressing a keen interest in remaining with The Doctor despite Tegan and Turlough’s initial distrust of him due to his origins. Although automatically designed as a slave, Kamelion demonstrated a certain degree of free will even when under the control of another. A particular example of this can be seen when Kamelion was briefly taken over by the criminal psychopath Maximillian Arrestis while investigating strange goings on at a time-travelling restaurant in the far future ("The Crystal Bucephalus"), subsequently being ordered to turn into something dangerous to threaten Arrestis’s enemies. Although Kamelion obeyed the order by transforming into a Sculti - a race that generated a bio-electric field capable of shutting down the human brain -, he neglected to inform Arrestis that the same field could also shut down the energy weapons that Arrestis was using, allowing The Doctor to gain the upper hand in the subsequent confrontation and send Arrestis - who had been rescued from the moment of his own death - back to the point in time where he’d come from. Despite the fact that he had prevented any serious damage being done, this adventure prompted Kamelion to resolve to remain inside the TARDIS from then on until he could be certain he would not be a danger to his fellow companions in case another being managed to take control of him. After this, Kamelion was generally left alone in the TARDIS by the others baring a brief occasion when Tegan had him assume the form of the Fourth Doctor to show Turlough what The Doctor looked like when she first met him after their meeting with The Doctor’s first three selves ("The Five Doctors"), unintentionally causing Kamelion to overload as he tried to access Tegan and Turlough’s subjective experiences and impressions, prompting The Doctor to provide him with a casket to shield him from data he couldn’t process properly ("Qualia"). Kamelion’s leisure time was generally spent linked up to the TARDIS’s databanks and learning more about its adventures, finding a certain similarity in their histories given their mutual background as shapeshifters serving the same master. However, he played a more active role during The Doctor and Turlough’s investigation of a British expedition to a mysterious hunting park on the Moon in 1878. Although the park was protected by an energy shield designed to contain an atmosphere that disrupted Kamelion’s systems when he left the TARDIS, after The Doctor, Turlough and the expedition members shut down the field, Kamelion was able to rescue The Doctor when he nearly suffocated in the crater as the oxygen began to fail, subsequently posing as a vision of Prince Albert to convince Queen Victoria to abandon further efforts at space travel after helping The Doctor and Turlough defeat the ruthless Vrall before they could launch a full-scale assault on Earth ("Imperial Moon"). Shortly after this, however, Kamelion’s legacy as The Master’s ‘tool’ came back to haunt him. Having recently been shrunk to the size of a doll while trying to increase the power of his Tissue Compression Eliminator, The Master was forced to use a remote control room to enhance his still-present telepathic control over Kamelion, influencing the android to take the TARDIS to the planet Sarn, where The Master could use the numismaton gas - a powerful healing agent if channelled properly - generated by the planet’s core to restore himself. Despite the best efforts of The Doctor, Turlough, and new companion Peri - whose will proved powerful enough to temporarily override The Master’s control over Kamelion on brief occasions - to free him from The Master’s influence, Kamelion finally asked The Doctor to kill him to prevent him from ever being used against his friends again, The Doctor reluctantly complying with his request by using The Master’s own TCE ("Planet of Fire"). Even after this tragic loss, however, Kamelion’s legacy remained. Although The Master once attempted to use his and The Doctor’s link to Kamelion to ‘encourage’ The Doctor to die during his fifth regeneration - The Doctor requiring telepathic assistance from his former companion Nyssa to find the necessary strength to find the mental manifestation of the Watcher in his ‘dream’ ("Circular Time: Winter") -, Kamelion himself made a brief, unexpected return to aid the Fifth Doctor and Peri when they found themselves participating in the search for the mythical treasure of Rovan Cartovall ("The Ultimate Treasure"), lost for centuries on the planet Gelsandor and guarded by the mysterious Seers. Due to his link with the TARDIS and his partial existence in other dimensions, a portion of Kamelion’s personality remained despite his physical death, the Seers using that fragment to create a new body for Kamelion in the form of the unicorn-like armoured creature known as Red (His body was based on Peri’s thoughts of heroic dogs and knights). Although his body proved to be too unstable to last for long, Kamelion died content after he was able to help The Doctor and Peri face the challenges of Gelsandor, saving Peri from a crashed ship, driving away insane villagers who threatened to execute The Doctor, and protecting them and their allies from a deranged android.